Kaiser Wilhelm der Grosse - sheltered promenade deck Norddeutscher Lloyd steamship built 1897 at Stettin by AG Vulcan. This image shows the sheltered promenade deck. Description : Norddeutscher Lloyd steamship built 1897 at Stettin by AG Vulcan. 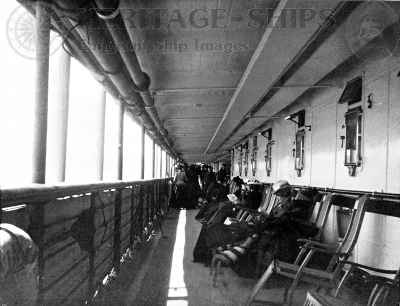 This image shows the sheltered promenade deck.